Sri Lanka's government has ordered the closure of all schools for two weeks, in case of reprisal attacks following the bombing of a former orphanage. 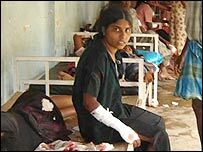 Tamil Tiger rebels say 61 schoolgirls were killed and 150 other children hurt in the air raid in the rebel-controlled northern district of Mullaitivu. The government denies the claim, saying its jets hit a rebel training camp. International truce monitors and UN staff said they had found no evidence the site was used as a military base. However, they were unable to verify the number of people killed. They reported seeing the bodies of 19 people at a nearby hospital, most of them women around the age of 18. Witnesses to the air strike had described four aircraft flying overhead and dropping about 16 bombs, the monitors said. There has been fierce fighting between government forces and Tamil Tigers in the north and east in recent days. Within hours of Monday's air strike, a bomb explosion in the capital Colombo killed seven people, including four soldiers, and injured 17 others. The target was the Pakistani High Commissioner's convoy, although it remains unclear whether he was hit on purpose or in a case of mistaken identity. Bashir Wali Mohmand, who was uninjured, said he believed he had been targeted because of the Pakistani government's support of the Sri Lankan government in its war against terrorism. 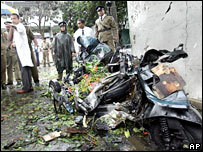 The Tamil Tigers' military spokesman, Irasaiah Ilanthirayan, told the BBC they were not responsible for the blast. The government has ordered the closure of all schools for two weeks from Tuesday, apparently fearing retaliation attacks. South Africa's cricket team is reportedly considering pulling out of a triangular tournament with India and hosts Sri Lanka because of concerns over security. Military officials said the rebels had infiltrated the Jaffna peninsula and hit residential areas in their attacks on the army, and that the air force was attacking to support ground troops fighting rebel advances in the area. "It is a lie to say that schoolchildren were targeted," government spokesperson Chandrapala Liyanage told the AFP news agency. 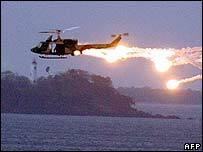 "The air force had bombed a LTTE training centre. We don't know if they had moved child soldiers there." The Tamil Tigers said the victims, who were aged between 15 and 18, were attending a first aid seminar. Junko Mitano, of the United Nations children's agency Unicef, told the BBC it had confirmation children had been killed in Mullaitivu. She said a statement would be issued on Tuesday. The Tigers have ruled out peace talks with the government while heavy fighting continues between the two sides. Aid agencies say about 100,000 people have been affected by the latest fighting. Sri Lanka's northern Jaffna peninsula has seen more heavy shelling and artillery fire as government forces and the Tigers battle for control of key areas. The recent flare-up in fighting has alarmed Sri Lanka's key foreign donors - the US, Japan, the European Union and Norway - who have called for an immediate end to the hostilities, which they said were "seriously unravelling" the 2002 ceasefire agreement. The ceasefire aimed to halt more than two decades of war between the government and the rebels, who are fighting for an independent homeland for the country's minority Tamil people in the north and east. It remains officially in effect, despite months of violence.